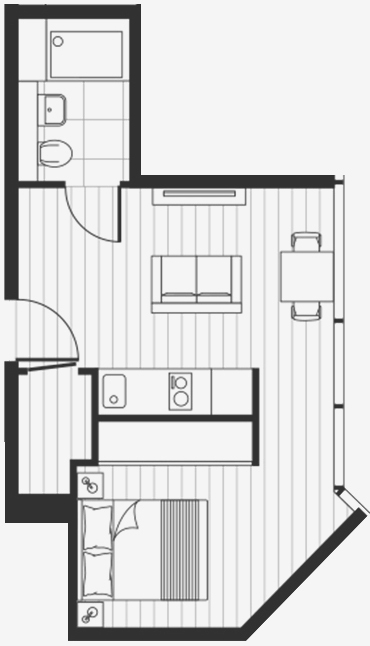 Combining convenience and style, this studio apartment will be finished with a simple yet modern colour scheme of matt white walls, brushed stainless steel door furniture and limed oak plank-style flooring for residents to personalise accordingly. The kitchen will boast high-gloss grey designer units, a grey glass splashback and will be finished with integrated appliances such as a dishwasher and a fridge/freezer. Meanwhile, the shower room will feature a white suite with large format, white, marbled porcelain tiling and chrome-plated finishes to the heated towel rail and single lever basin tap.